Double long handle calico tote bag. This product is part of our Green Conceptz Collection which promotes environmentally friendly, and eco friendly messages. Ideal for environmental projects as calico is a renewable resource. 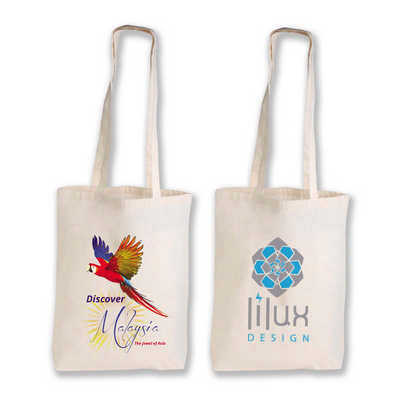 Most supermarkets and retail outlets sell and encourage consumers to use calico bags. Join the revolution to reduce the use of plastic shopping bags! Colours - Natural Size - Bag: 375mmL x 420mmH, Handle Length: 800mmL, Bottom Gusset: 70mmD Decoration Area(s) - Screen Print : Front/Back - 290 x 320 mm (LxH); Nucolour 4CP Digital Transfer : Front/Black - 210 x 297mm (LxH); RGB Direct to Garment Print : Front/Back - 290 x 290mm (LxH), Submit design for acceptance and price.